Oil palm is a highly productive crop and its vegetable oil is very versatile. It is therefore the most widely produced and traded vegetable oil in the world. In the main producer countries Indonesia and Malaysia, palm oil production has been responsible for extensive deforestation of forested peatlands and primary tropical rainforests. The global demand for vegetable oils as well as expansion of oil palm plantations is expected to grow further. In Indonesia, palm oil is mainly planted on the islands of Sumatra and Borneo (Kalimantan provinces) and now expanding into Papua New Guinea. In Malaysia, palm oil is mainly planted in West Malaysia and Sabah. The Kalimantan provinces as well as Sabah are situated on the island of Borneo. Not all palm oil is traded on the world market: In 2017, Indonesia produced 42 million tons and exported 31.1 million tons (74%). The main countries exporting to Europe are Indonesia (over 50% of global production, 50% of European imports in 2017) and Malaysia (around 30%, 22% of European imports) but increasingly also from Latin America (Colombia, Honduras). 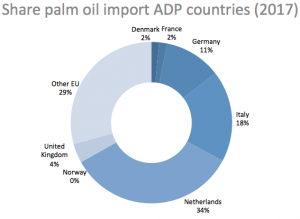 Within the EU palm oil is used for food purposes (app 50%), fuel (45%) and technical / pharmaceutical purposes. 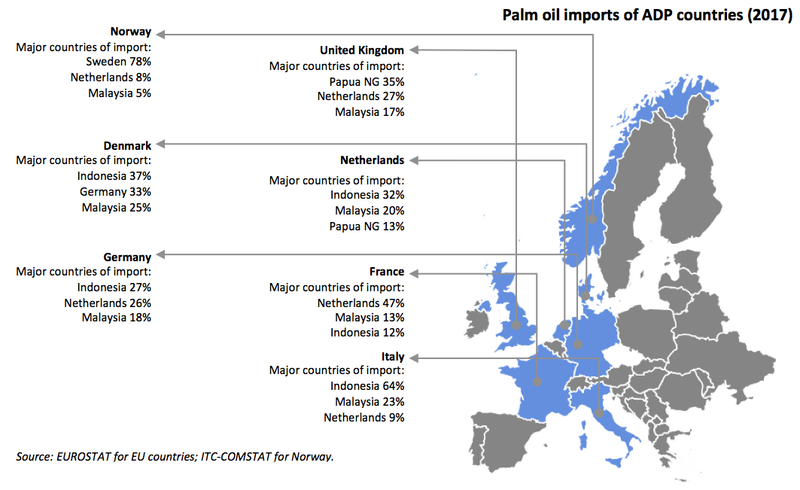 In 2017, the EU imported 7.96 million metric tons of palm oil of which the AD signatory countries imported 71%. In addition to the direct import, there is also significant intra-European trade. Further information on national level initiatives in the ADP countries: Denmark, France, Germany, Italy, Netherlands, Norway and United Kingdom. The AD-Partnership promotes the uptake of sustainably produced palm oil for example through certification by voluntary certification standards, which have cut-off dates for deforestation such as RSPO (Round Table for Sustainable Palm Oil) , ISCC (International Sustainability & carbon Certification), and RA-SAN (Rainforest Alliance). In Indonesia certified area by RSPO and RA-SAN reached 17% in 2014 and in Malaysia this was 25% (ISCC does not have publicly available data). The third largest producer country, Nigeria, has no certification by these standards. In 2014, palm oil was harvested on 18.5 million ha (FAOSTAT) and 15% was RSPO or equivalent certified (Lernoud et al (2017), State of Sustainability Markets). However, ESPO does not cover all uses in a country or the whole food sector and is working to include more companies. The Africa Palm Oil Initiative (APOI) brings together nine West and Central African governments, companies throughout the supply chain, and non-governmental organisations, in an initiative focused on securing a sustainable palm oil industry in the region. Support is provided to the process (funded by the UK through Partnerships for Forests). Together with Indonesia and Malaysia, France launched the SALSA (Sustainable Agricultural Landscapes in Southeast Asia) partnership platform. This platform is dedicated to the analysis of perennial crop systems sustainability throughout the region. The launch of this ambitious scientific platform, in which training will be a pivotal component, was formalized by the signing of two multilateral agreements, under the patronage of the French Head of State, in the presence of the Prime Minister of the Malaysian Government and the President of the Republic of Indonesia. The IDH Sustainable Trade Initiative has defined palm oil as one of their focal commodities and IDH is implementing sustainable landscape initiatives in West Kalimantan, South Sumatra and Aceh in Indonesia. Another important organisation working on palm oil is Solidaridad, which works on responsible supply chains and small-holder inclusion in Colombia and Indonesia. 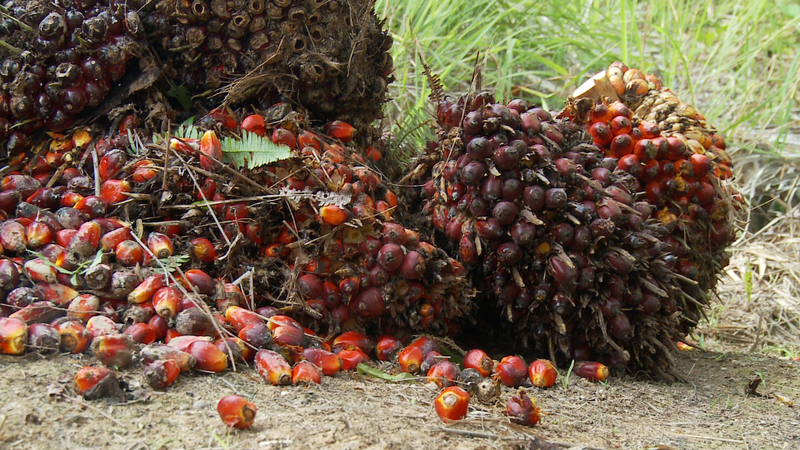 Solidaridad (with support of the NL) has established a Sustainable Palm Oil Working Group. On June 10, 2016 a Chinese delegation including the Chinese Chamber of Commerce visited the Netherlands and met the AD-countries to discuss sustainable palm oil and soya. In November 2016, Chinese companies visited sustainable palm oil plantations in Indonesia (study tour organised by Solidaridad) and met with Indonesian government, companies and civil society organisations. They also met the Dutch Minister of Foreign Trade and Development, who also visited Indonesia at that time. April 2017, Chinese companies visited the Netherlands in a study tour on import of sustainable commodities. The China Chamber of Commerce of Foodstuffs and Native Produce (CFNA) produced a ‘Guide for Overseas Investment and Production of Sustainable Palm Oil by Chinese Enterprises’ (with support of the UK InFIT Programme). The guide has yet to be implemented. A great example is Sabah’s jurisdictional approach towards sustainable commodity production. In 2015, the Sabah State government in Malaysia committed to only producing (RSPO) certified palm oil by 2025. In addition Sabah committed that its forests would become 100% (FSC) certified by 2018 and its totally protected terrestrial areas would cover 30% of total land area by 2025. Its main goals were (1) zero deforestation; (2) zero conflict; and (3) sustainable smallholder livelihoods. The commitment would be implemented through a participatory approach involving all relevant stakeholders. With over a fifth of its land planted with palm oil and producing 30% of Malaysia’s production, full deforestation-free, sustainable palm oil would be a major achievement. The multinational companies Unilever and Marks&Spencer committed end 2015 to preferential sourcing from jurisdictions that have designed and are implementing forest and climate initiatives, or in other words, strive to produce commodities deforestation-free and sustainably.